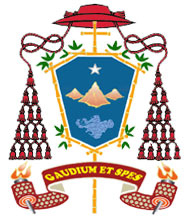 Cardinal Nguyen Van Thuan's motto is the title of the pastoral constitution: Gaudium et Spes - Joy and Hope. He adopted the motto not only because there was always joy and hope in his heart no matter what happened to him, but also because he wanted to make a statement: He saw the teachings of Vatican II as showing the Church in its progress towards the ultimate Unity, that was why there was joy and hope for all human kind. His coat of arms showed a blue background and a white star for the Virgin Mary, Stella Maris (Star of the Sea). Set against the blue under the star were three mountains representing aqua et arida, the sea and the land. The three mountains represent the three regions of Vietnam: North, Central, and South Vietnam. The three mountains and the sea represented Nha Trang as well as Vietnam, sitting on the Pacific Ocean. In ancient times aqua et arida meant the entire world, and thus the words symbolized that Vietnam is not an isolated country but is part of the world. The star is the Star of the Sea (Stella Maris), the symbol of the Virgin Mary. The star guides the boat in its voyage through this life into eternity. The ten bamboo segments represent the ten commandments. The bamboo is an Asian symbol of the quan tu or the Superior Man. It reminds one of the Coat of Arms of late President Ngo Dinh Diem, whose motto was Tiet Truc Tam Hu (The segments are straight, the heart is empty). The bamboo represents righteousness, incorruptibility, and sincerity. The heart of the bamboo is empty like the heart of a person that is not filled with selfishness, ambition, and greed. The harmony of the background (with symbols that came from ancient Rome and the Universal Church) and the frame representing the Asian culture and the values of the Cardinal's family, together with the motto, summarizes the teaching of the late Cardinal and his vision of the world, the Church, his country, his family, and himself.